It's a troubled time in the town of Ravenport. A band of monsters has pressed past the guards at Bronze Valley South and made a new home in the once peaceful seaside town. Most of the villagers run in fear of the monsters and their powerful overlord, but not all are so timid. Small forces are resisting the rule of the intruders, taking down the monsters one by one. As they fight, they gain reputation throughout the town and attract new fighters to join their cause. 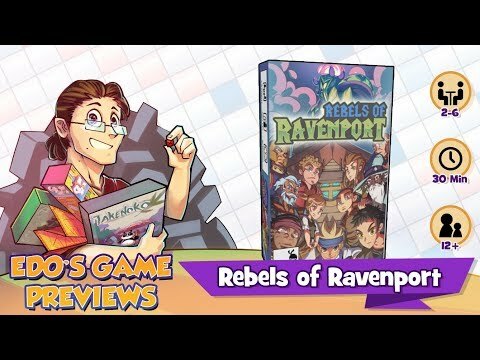 These are the Rebels of Ravenport. Players take the role of guild leaders who must defeat the monsters and expand their guild. Each player starts off with a small guild of 3 rebels, and can attack one monster each turn. They roll the 3 dice to determine how much damage they deal against the monster. Each rebel deals 1 to 3 damage when a specific number (1 through 6) is rolled. To defeat the monster, they must deal damage greater than or equal to the monster's health. If successful, the guild gains reputation and victory points. The game board displays the monsters and contains 5 face up cards that the players may acquire. Cards come in two categories - rebels and artifacts. Each turn the players can use their reputation to buy one of these cards, and then replace the empty card slot with the top card of the deck. There are two ways for the game to end, so players must strategize toward one (or both) of the goals. First, a guild can select to attack the mighty overlord (who has 12 health) on their turn. If they defeat him, they win the game. Alternatively if the victory point pool is depleted before the overlord is defeated, the player with the most points is the winner. The game is setup with an amount of victory points equal to 10x the amount of players in the game. 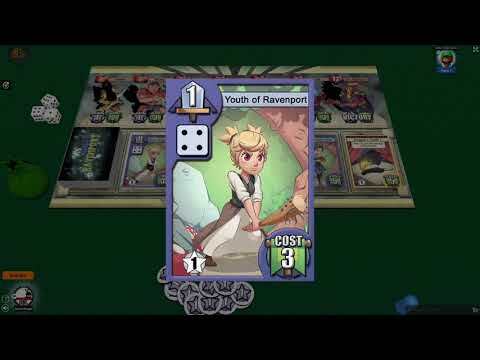 Points are obtained by defeating monsters, by acquiring cards, and through various card abilities. This two-goal setup creates tension between the players, with some building heavy damage in an attempt to take down The Overlord before the others take the final victory point.